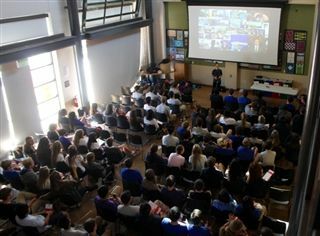 On Tuesday, December 8th, representatives from Liberty in North Korea (LiNK) presented to Upper School students about the plight of citizens in North Korea who experience harsh living conditions and who are sealed off from the rest of the world by the North Korean government. In addition to raising awareness of human rights issues, the group organizes rescues of North Korean refugees hiding in China and resettles them in South Korea and occasionally in the United States. As of October, 2015, over 400 refugees have been rescued and resettled. The LiNK service learning group helps raise awareness on campus and assists in fundraising for the organization.